The United States has approved the sale of Boeing/Airbus aircraft to Iran through the issuance of licenses from the Treasury Department. 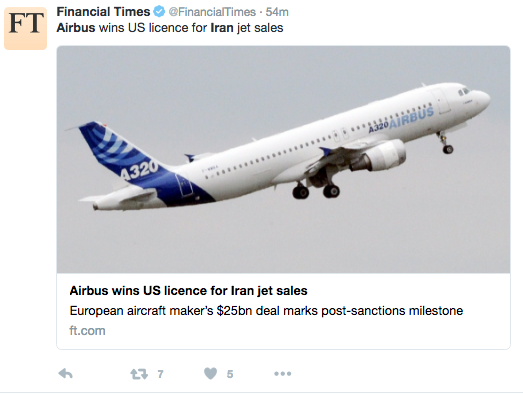 These licenses will cover the sale of Western passenger jets (Boeing) to Iran and the export of some European Airbus jets within days. Airbus has confirmed that it has received a U.S. license for 17 aircraft for immediate delivery to Iran (Airbus jetliners contain a high number of U.S. parts and requires U.S. approval for sales to Iran as a result). Boeing and Airbus have both agreed to sell or lease more than 100 aircraft a piece to IranAir while Iran continues to build up its aviation industry; this of course following the Iran nuclear deal that was agreed upon last year that lifted sanctions off the country. Boeing and Airbus have both experienced slow sales in the past year and this sale to Iran would greatly benefit both companies with jetliner deals measuring over $50 billion. However, the sale of these jetliners would still be on shaky ground as U.S. banks are still forbidden to do business with Iran, putting wary bankers in a very precarious position. The sale moves forward despite the House passing the Financial Services and General Government Appropriations Act 239-185 that bans the sale of Boeing/Airbus jetliners to Iran.